Doug Badger, a senior fellow at the Galen Institute, says young adults will be the group most adversely affected by the ban on short-term plans. “Ages 26 to 34, in particular, have the highest uninsured rates in the country,” Badger said. “The reason for that is the ACA regulations charge them unfairly high premiums to subsidize, essentially, their parents. People in their twenties and thirties are asked to pay unfairly high premiums to subsidize those in the fifties and sixties, who purchase plans for unfairly low rates.” Skyrocketing premiums have reduced the number of young adults purchasing insurance, Badger says, and the short-term plans could help remedy that. “A crisis of affordability.” That’s what is plaguing the individual health insurance market, according to Seema Verma, the administrator of the Centers for Medicare and Medicaid. The culprit? Obamacare. The health law’s regulations have steadily driven up the cost of insurance. Between 2013 — the year before most of Obamacare’s provisions took effect — and 2017, premiums for individual plans doubled. They’re expected to jump another 15 percent next year. The Trump administration handed the decision about whether to offer short-term, limited duration health care plans over to the states. California immediately passed legislation to ban the sale of these plans, which the Trump administration had expanded access to by allowing for a longer renewal period and carrying time. Doug Badger, an expert on these plans, talks about why California’s decision is bad news for people seeking affordable alternatives to Obamacare Exchange plans and how, despite this, the move to let states decide is the intent of a federalist system. A few states have found a key to undoing some of Obamacare’s damage to their individual health insurance markets by redirecting some federal funding to help sick people. These states are providing separate assistance to those with the highest health costs, thereby reducing premiums and increasing enrollment for healthy people driven out of the market by soaring costs. 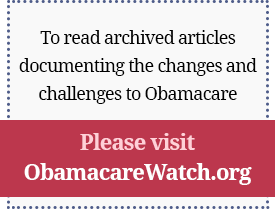 Obamacare’s rigid and centralized federal regulation of the nongroup market is failing. Premiums have risen, choices have contracted, and enrollment in individual policies continues to fall. Section 1332 of the Obamacare statute provides states with very limited authority to escape Obamacare’s mandates and test new approaches to undoing some of this damage. Several states have successfully used a waiver to change market conditions sufficiently that premiums fell for individual health insurance while still protecting the ability of people with high health care costs to access care. Waivers alone, however, are not enough. Congress should enact legislation to empower states to establish consumer-centered approaches that reduce health care costs and increase choices. To make incremental progress towards this goal, the Trump Administration can simplify the unnecessarily restrictive waiver progress established by the Obama Administration in order to provide near-term relief to consumers without new federal spending. Maine’s Republican governor has said federal regulators want to know how Maine would pay for Medicaid expansion. But it’s unclear just how that issue will play out in Maine, the first state to pass Medicaid expansion under Republican President Trump’s administration. The Wisconsin Department of Justice has filed a new lawsuit against the federal government over a fee for health insurers under the Affordable Care Act. State Attorney General Brad Schimel announced last week the state had filed the lawsuit, along with a motion for a temporary restraining order against President Donald Trump’s Administration, as the deadline nears for Wisconsin to pay more than $30 million through the health insurance providers fee.